Ideal for use when large capacity and high resolution are required at the same time.The EK-15KL has 0.1 g readability across its full 15 kg capacity. The EK-30KL has a smart rangefunction. This is especially useful when the gross weight exceeds 3 kg yet 0.1 g readability isneeded to measure net weight when using heavy tare containers. A single press of the re-zerokey restores the 0.1 g precision range up to 3 kg. Large (11.8 x 8.2 in.) 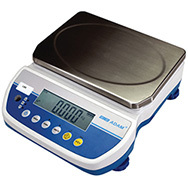 pan for convenient weighing of bulky objects. 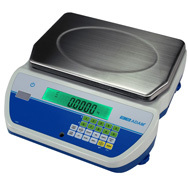 Hygienic stainless steel (SUS430) weighing platter. Easy-to-read LCD display with clear, white backlight ( 7/8" character height). 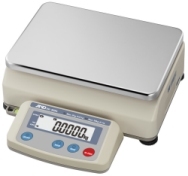 Multiple weighing units: g, kg, oz, lb, ozt. Application modes: parts counting, % weighing, HI/LOW/OK comparator and Display hold. Security ring for wire-locking the scale to prevent theft. Data output to a PC or printer, via RS-232C interface. Auto Power-OFF function. Operation with either AC adapter or optional rechargeable battery. Cast metal base with ABS housing.